Meat has a Very BIG carbon footprint and negative impact on the environment. Factory farming, in particular, contributes to methane leaching which is 36 times worse for the atmosphere than carbon dioxide. All that untreated waste pollutes water systems and contributes to erosion. The hormones and antibiotics used are making super bugs immune to them which seriously compromises human health. It is also much better for your heart and can significantly reduce inflammation in your body. It is also better for animals. By replacing at least half of your meat dishes with vegetarian dishes you are really helping the planet, your health and the atmosphere. By adding vegetables to every meal you will fill up on the healthy stuff. 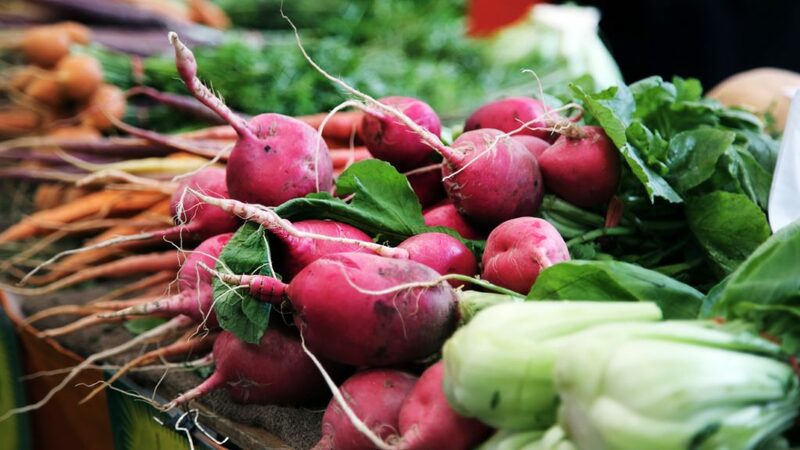 Farmers markets are a great way to really get fresh seasonal vegetables. If you are going to eat meat choose grass fed meats by farmers who practice carbon farming.